HIAWASSEE, Ga. – Early voting in the 2018 midterm election came to a close on Friday, and Towns County Board of Elections saw a massive turnout at the Hiawassee polling precinct. Of the 9,386 registered voters in Towns County, 4,030 residents chose to cast their ballots ahead of Tuesday’s general election. A total of 257 absentee ballots had been returned to the election board as of Friday afternoon. The 2018 turnout rivals that of the 2016 presidential election. 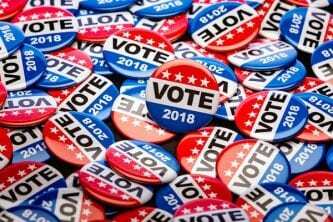 Two years ago, 4,564 of the 8,608 voters registered in Towns County turned up to cast early ballots at the polls, with 420 ballots returned by mail. Midterm elections historically do not draw such a high amount of voters to the ballot box. FYN reached out to Towns County leaders and gathered their thoughts on the phenomenon. “The fate of our state and our county is at stake,” Towns County Commissioner Cliff Bradshaw expressed, “Towns County realizes how important this election is for our future, and I’m very thankful for that.” Commissioner Bradshaw served as Master of Ceremonies at a recent “Get Out the Vote” event sponsored by the Towns County Republican Party. While the four local leaders agree that the high voter count is good sign for their affiliated political party, the Republicans stressed the importance of an equally healthy turnout at the polls on election day. Towns County polling precincts will be open from 7 a.m. to 7 p.m. on Tuesday, Nov. 6. Count on FYN to deliver local election results as soon as they become available.